Be the first to share your favorite memory, photo or story of Winifred. This memorial page is dedicated for family, friends and future generations to celebrate the life of their loved one. Dream then, Winifred, dream of peace, dream of a life well-lived, dream of a life well-loved. The magnitude of your accomplishments, indeed, must give us pause. Born in Cleveland, Ohio, the only child of artists Margaret and Otto Giebel, her “Mommy”, a musician, her “Daddy”, an artist. This heritage was passed on to her as a child while growing up in Jefferson Park and attending St. Cornelius Grade School. 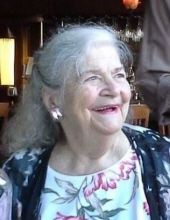 Her mother was the church organist and choir director, and Winifred would later write and direct many talent shows at her own Parish of St. Thomas the Apostle in Crystal Lake. She studied operatic voice while attending Immaculata High School and Loyola University. She performed as a soloist as a longtime member of the St. Thomas Choir and also the New Oratorio Singers in Barrington, throughout her adult life. An astute knowledge and appreciation of the theater directed her from staging plays for P.A.C.T. in Crystal Lake, to the Curious Theater Branch in Chicago, and to the Chicago Cultural Center. She saw her vision of a home for senior actors realized in the Primus Theatre. Her dedication was unwavering, her writing and teaching was beloved, and her talent was heralded during two decades of performances. Winifred enjoyed wordplay, whether in the form of a script from a play, or as poetry (both of which she had composed), or while playing her favorite game of Scrabble. Within her residence, Renaissance Court on Belmont Avenue, she pursued her passions while “holding court” with both poetry and Scrabble clubs. She had parlayed that same talent into a long career as a proofreader and copy editor for the Journal of the American Medical Association. As a clever, learned conversationalist, she was always “an artist in residence.” She would engage friends and family members in lengthy discussions on a myriad of subjects while both imparting wisdom and listening with keen interest, always with a great sense of humor. She was a woman of faith; faith in her God, faith in her children, faith in the human spirit. Her love was bountiful, her respect well-earned, and, freely given, her support unwavering. Her kindness extended beyond her ever-growing family. Many young people knew her as a second mother and were devoted to her throughout their lives. She often spoke of her 37 grandchildren and 13 great grandchildren, sharing their lives and artistic endeavours. Her artistic heritage has now encompassed five generations. She preferred to be known as “Grandma” or as “Grandmama”, but, her own 14 children would certainly call her a “Grand Mother” . Long ago at bedtime, Winifred, Mom, had sung to her children softly, gently, in her beautiful voice. “Hushabye, don’t you cry, go to sleep my little babies”. Then as a final prayer, she had whispered a litany of their beloved names. Visitation Wednesday, April 3rd, 3 p.m. until 8 p.m. at Drechsler, Brown, & Williams Funeral Home, 203 S. Marion St., Oak Park. Family and friends will gather on Thursday, April 4th at St. Giles Church, 1045 Columbian Ave., Oak Park for a 10 a.m. Mass of Resurrection. Interment Private at All Saints Cemetery, Des Plaines. To send flowers or a remembrance gift to the family of Winifred Ann Giebel O'Reilly, please visit our Tribute Store. "Email Address" would like to share the life celebration of Winifred Ann Giebel O'Reilly. Click on the "link" to go to share a favorite memory or leave a condolence message for the family.